As a note: this recipe is best after it has aged for a day; so when possible, prepare a day ahead of time. Start by preparing the sweetened coconut cream. Preheat the coconut mana until it is soft, and then stir it vigorously to mix it up, otherwise all the oil and coconut meat will have separated out. Now, pour 1 can of coconut cream in to a pot, and turn the heat on to a low setting, 2 or 3 out of 10. As it heats up, add the coconut mana, and stir slowly but constantly. As the coconut mana begins to mix in, add the coconut sugar and honey to the mix. This will turn the mixture a light brown, because of the color of the coconut sugar. This is ok – it will not show in the final product. Keep stirring the mixture until everything is evenly blended, and the warm mixture now stirs easily, then turn off the heat and let cool. In a large mixing bowl, put your egg whites and whip them until they are fully white and foamy (recommend using a machine whisk for this). In a second large mixing bowl, add the sweetened coconut cream, the remaining can of coconut cream, the shredded coconut, and the vanilla, and mix thoroughly. Now it’s time to prepare your cake pan or pie pan which you’ll be letting the base sit in to cool and thicken. Take it out, and completely coat the inside surface with coconut oil. It should not be thick, but it needs to cover the surface entirely. In a clean pot, put the gelatin powder and a cup of water, and turn the heat on a low setting again. Stir these constantly until warm and steaming; do not let it boil. 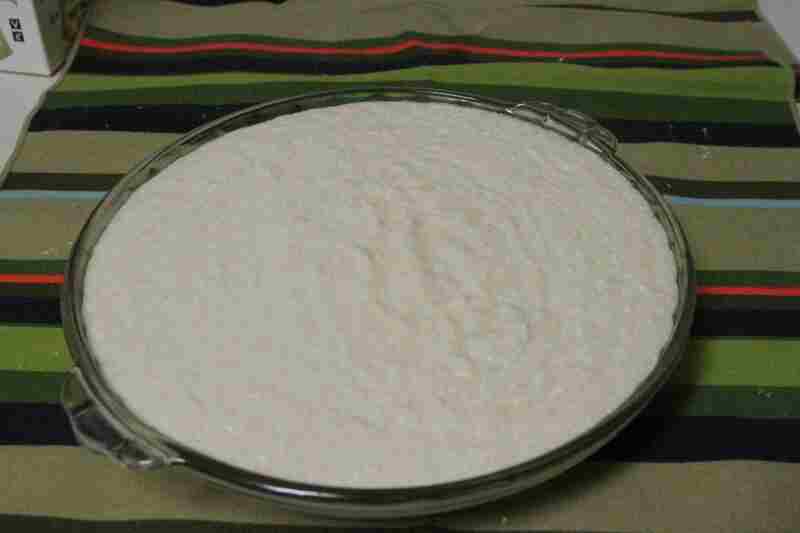 Once the gelatin mixture is warm and steaming, it to the coconut cream mixture and stir quickly, trying not to spill, for 20-40 seconds. Now add the foamed egg whites, and again stir vigorously for 20-40 seconds. Now quickly pour the mixture in to the cake or pie pan. Cover the pan completely to keep the fridge air out, I use aluminum foil, and place carefully in the refrigerator on a flat surface to let it cool and thicken. Now it’s time to make the raisin sauce. Put the 1 cup of water and 2 cups of raisins in a blender. Blend them completely. As a note: to avoid overworking your blender motor, I recommend starting on “Chop”, and slowly increasing the blade speed through “Blend” to “Puree”. Take the pureed raisins and add them to a large pot on the stove with the heat on a low setting (2 to 3 out of 10). Let this warm up a bit before adding the flour; you’ll know it’s ready when it starts steaming, but do not let it get to a boil. Stir constantly but slowly. Add the coconut flour while stirring, I recommend one half tablespoon at a time so that it does not clump. As soon as the coconut flour is fully absorbed, and you have made certain that there is no clumping, turn off the heat, take the pot off the burner and let it cool to room temperature. 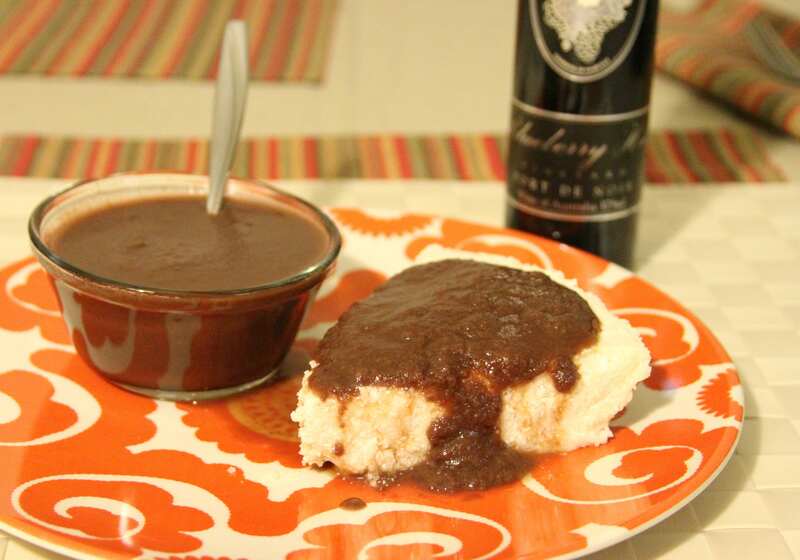 Once it has cooled to room temperature, add the wine to the sauce, and mix thoroughly. Now store this in a container in the fridge, also to be served at room temperature. About 30 minutes before you will be serving the dish, remove both dishes from the fridge. Place them on a counter top which will not be in the way, and let them sit, still covered, to warm up to room temperature. 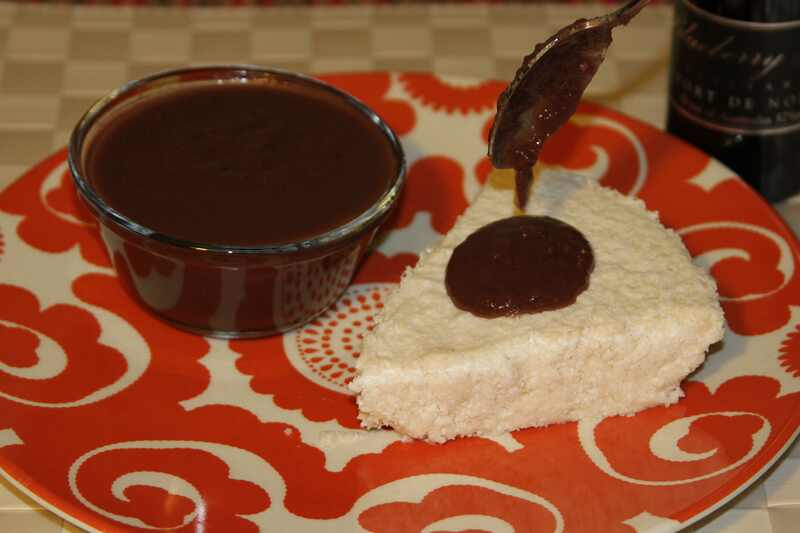 Once it’s time for desert, serve the coconut base first, and then drizzle the raisin sauce over the coconut base. Now enjoy another urbanpaleochef special! ← Grass-fed Ground Beef – with Bacon Mash!